Pair of 12mm yellow boat mooring ropes x 6mtrs long. These pre-made or pre-spliced mooring lines are suitable for all kinds of boats, yachts and narrowboats. 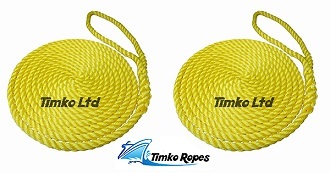 Pair of 14mm yellow boat mooring ropes x 6mtrs long. These pre-made or pre-spliced mooring lines are suitable for all kinds of boats, yachts and narrowboats. Pair of 12mm yellow boat mooring ropes x 8mtrs long. These pre-made or pre-spliced mooring lines are suitable for all kinds of boats, yachts and narrowboats. Pair of 12mm yellow boat mooring ropes x 10mtrs long. These pre-made or pre-spliced mooring lines are suitable for all kinds of boats, yachts and narrowboats. Pair of 14mm yellow boat mooring ropes x 8mtrs long. These pre-made or pre-spliced mooring lines are suitable for all kinds of boats, yachts and narrowboats. Pair of 16mm yellow boat mooring ropes x 6mtrs long. These pre-made or pre-spliced mooring lines are suitable for all kinds of boats, yachts and narrowboats. Pair of 12mm yellow boat mooring ropes x 12mtrs long. These pre-made or pre-spliced mooring lines are suitable for all kinds of boats, yachts and narrowboats. Pair of 14mm yellow boat mooring ropes x 10mtrs long. These pre-made or pre-spliced mooring lines are suitable for all kinds of boats, yachts and narrowboats.